Design Recipes for FPGAs provides a rich toolbox of design techniques and templates to solve practical, every-day problems using FPGAs. Using a modular structure, it provides design techniques and templates at all levels, together with functional code, which you can easily match and apply to your application. 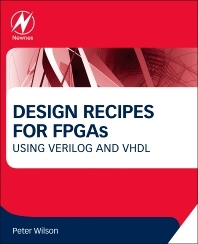 Written in an informal and easy to grasp style, this invaluable resource goes beyond the principles of FPGAs and hardware description languages to demonstrate how specific designs can be synthesized, simulated and downloaded onto an FPGA. In addition, the book provides advanced techniques to create ‘real world’ designs that fit the device required and which are fast and reliable to implement. 6.7 What Is Being Synthesized? Peter Wilson is Professor of Electronic Systems Engineering in the Electronic and Electrical Engineering Department at the University of Bath. After obtaining degrees at Heriot-Watt University in Edinburgh he worked as a Senior Design Engineer with Ferranti, Scotland and then as a Technical Specialist for Analogy, Inc. in Oregon, USA. After obtaining his PhD at the University of Southampton, he joined the faculty and was a member of the Academic staff at the University of Southampton from 2002 till 2015 when he moved to the University of Bath. He has published more than 100 papers and 3 books. Peter Wilson is also a Fellow of the IET, Fellow of the British Computer Society, a Chartered Engineer in the UK and a Senior Member of the IEEE.